Attend this meetup to catch up some expertise on content marketing, SEO and social networking which help your business prosper. Marketers are facing new challenges and trends within this digital age but didn’t get any professional and accurate advice. Most of the online marketers are looking for the expertise in content marketing, seo and social networks to take businesses to next level. Every small-business, Enterprise, Big-companies always keep an eye on a good marketer and being a marketer you have to keep running with the new trends and strategies. So, how can you become an SEO expert or Content marketing expert? Or you want to be more successful each and every field? Well, You can. SEMrush team again comes up with the meetup at Ahmedabad on this Friday, 16th March. The demises of this meetup are Fernando Angulo, Jaydip Parikh and Rohan Ayyar – The best marketers on their field. I am sure after attending this meetup you will catch up some expertise on content marketing, SEO and social networking which help your business prosper in 2018. This event is supported by Tej SolPro solution with the SEMRush. This meetup has a four-hour session about Content Marketing, SEO, Social networks that will give a chance to fly your business in 2018. Why will you attend this meetup? 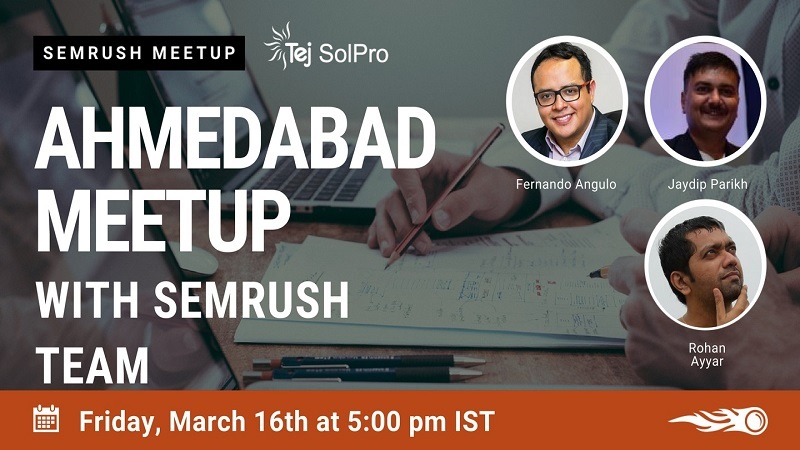 Register for the SEMrush Ahmedabad meetup by clicking eventshigh.com. Fernando Angulo is a Corporate Speaker at SEMrush with over 5 years of practical experience in online marketing. Fernando specializes in B2B search marketing, e-commerce, competitive intelligence, and influencer marketing. He will immediately engage you with his energy, sense of humour and a lot of practical examples and real cases! Jaydip Parikh is the CEO of Tej SolPro and a Digital Marketing Strategist. Having more than 15+ years of experience in Marketing and Digital Marketing and being an active speaker both online and offline, Jaydip also focuses on Social Media and E-Commerce consultancy. He has given lectures on Digital Marketing at various renowned institutes like NIFT, DDIT, Changa University, C.U. Shah Engineering College, Ahmedabad University, Nirma University, to name a few. He has also worked with brands like YourStory, CIIE-IIM, Kevi Rite Jaish, Saptpadii (ABCL Movie), Shamiana etc. A man who is involved in creative content strategy, web analytics, conversion optimization, and campaign execution at E2M, one of India’s fastest growing digital marketing agencies. Rohan Ayyar is also an avid business and tech writer, with posts featured on Fast Company, The Next Web, Entrepreneur, and other major publications. It will become indeed one of the best experiences for marketers to attend SEMRush meetup and learn the new things. We look forward to attend similar seminars, meetups and webinars to strengthen our knowledge and insights of the industry. After all, knowledge is power! If you still didn’t get your ticket, you can book now here eventshigh.com. Krishna Patel is a Digital Marketing Executive at Acquire and Jagat Media. She is also a blogger and writing about Digital Marketing and its new updates. She believes and always keeps trying to do something new. When Krishna steps out of office, she loves to spend time with loved ones. Feel free to follow Krishna on Twitter and LinkedIn. Great article good explanation of things which are related to content marketing. I glad you liked it! Keep reading for new updates! How Real Estate Businesses Can take advantage of Digital Marketing Strategies?